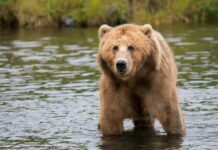 Last week, the International Union for the Conservation of Nature (IUCN) released their new study, Reforesting for the climate of tomorrow. Researchers identified key tree and plant species that are resilient to climate change. 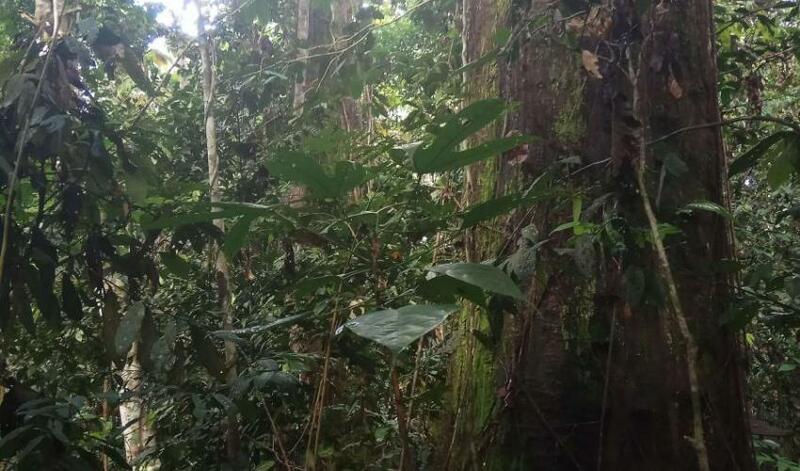 The study analyzed 250 species of trees and plants native to Indonesia’s Kutai National Park, looking for species that had low sensitivity to changes or high capacity to adapt to them. Out of the 250 species, the Bendang and Ulin were singled out for resilience to fire. Seven plant species identified as climate-resilient emerged as food sources for East Bornean orangutans. 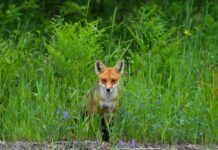 The authors of the study recommended that these species be placed alongside vines that orangutans use for moving through the forest and trees such as the Ulin. 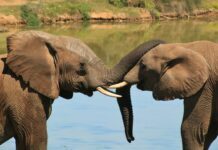 They’ve also advised to avoid planting in areas with human activity to minimize potential conflict. Borneo, the world’s third-largest island, has lost more native rainforest than anywhere else in the world. 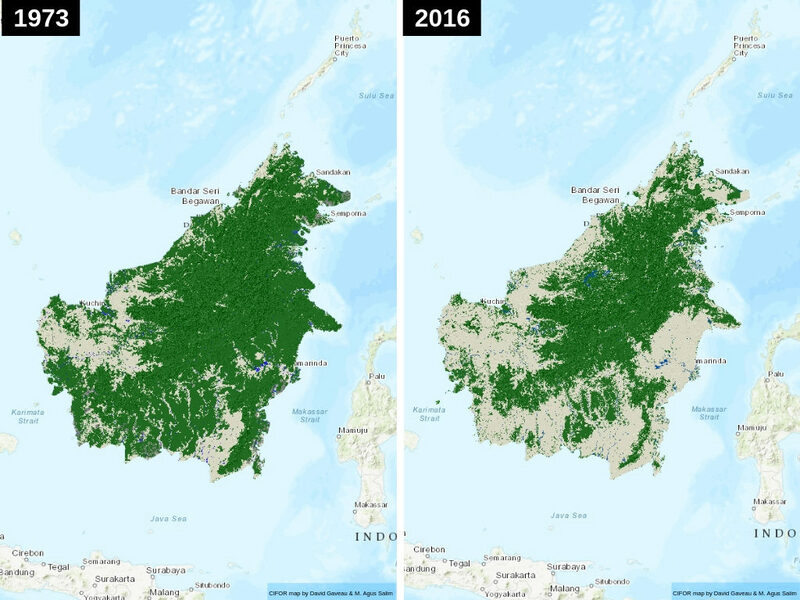 Four decades of forest loss, degradation, and industrial plantation expansion in Borneo. According to the World Wildlife Fund, palm oil plantations, pulp plantations, forest fires, and illegal logging are the leading causes of deforestation in Borneo. 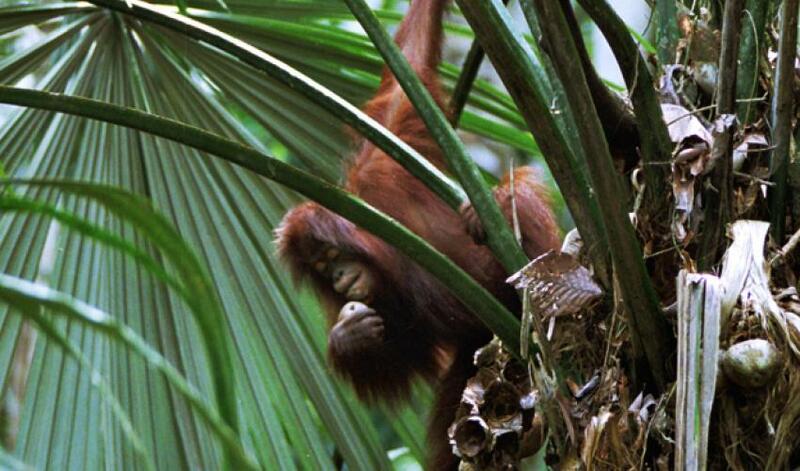 Orangutans are dependent upon the contiguous forests for shelter and food. With palm oil plantations taking up more and more of their habitat, orangutans often find themselves lost on the plantations. 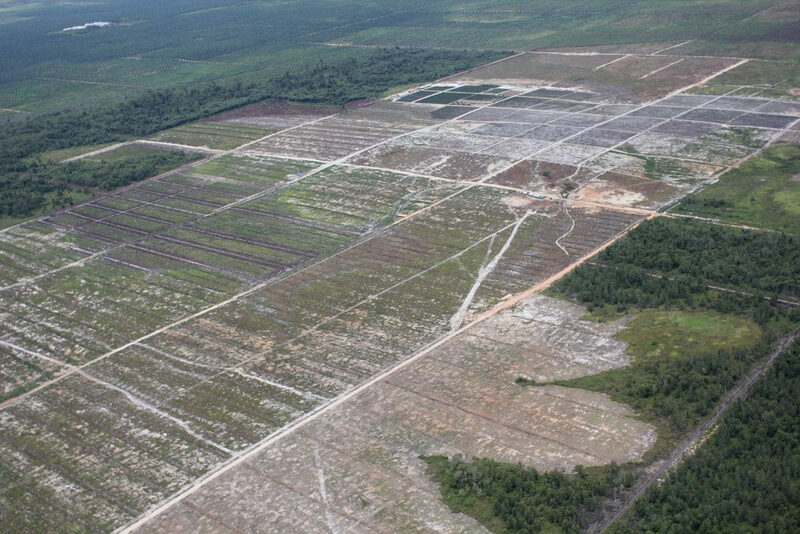 Peatland deforestation for palm oil plantation in Borneo. A 2018 study led by Dr. Maria Voigt found that Borneo lost more than 100,000 orangutans between 1999 and 2015, cutting the population in half. Researchers found that population declines were steepest in areas transformed for industrial agriculture, commonly palm oil or paper pulp plantations. Once an orangutan has wandered onto a plantation, they are treated as pests. In 2006, it was estimated 1,500 orangutans were beaten to death by palm oil plantation workers. Sadly, these practices continue today. 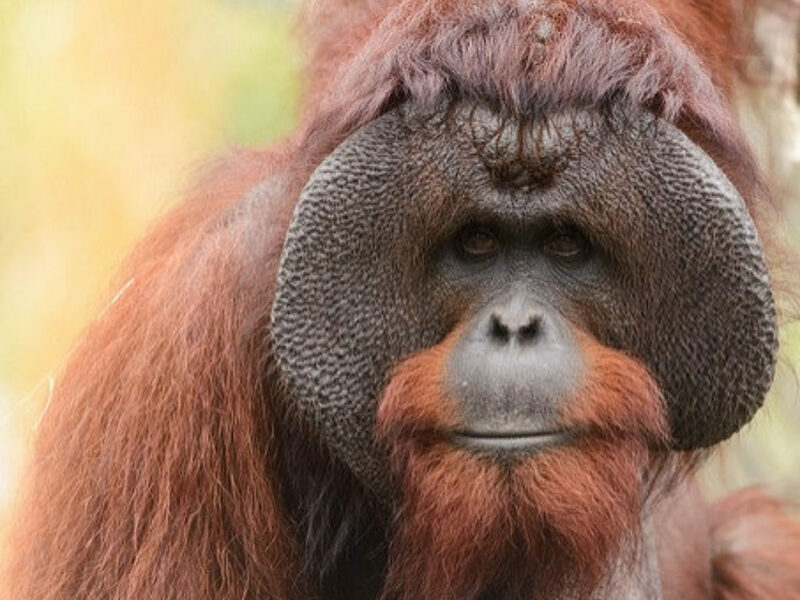 Last year, the death of a male Bornean orangutan made headlines after being brutally stabbed, clubbed and shot 130 times with an air gun. In an interview with the London-based Evening Standard, Dr. Galdikas urged people to avoid palm oil as often as possible. “Try to avoid palm oil as much as possible, in food and detergents that you use, and toothpaste.” Until we get truly sustainable palm oil, which may be on the horizon, I’d recommend reading supermarket labels, product labels and staying away from the wrong oils,” said Galdikas. Finding alternatives to unsustainable palm oil must be a priority. Biteback, an insect bio-refinery company, has developed one alternative: insect oil. Biteback hopes to meet the growing demand for palm oil with insect oil, a healthier and more sustainable alternative. The company grows and harvests superworm larvae (Zophobas morio) to extract their oil for use in cooking oil, butter, and cosmetics. The superworm larvae outperform palm oil by almost 40 times in the same area of land, requires less space and can be scaled vertically. In a recent article, Dr. Voigt wrote that prevention is more important than rescue. “Once forests are maintained and protected, and killing is stopped, orangutan populations can be stabilised. It might even allow them to slowly bounce back and recolonise forest areas where orangutans have disappeared in the past,” Voigt wrote. Prevention along with reforestation efforts will be critical factors in the future of Bornean orangutans. “Kutai National Park was once one of the most important lowland rainforest sites in Borneo, and its degradation is a major loss not only for Indonesia but for the world. But there is a glimmer of hope in that populations of threatened East Bornean orangutans persist there and work continues to restore forest cover in the park. Selecting which species to plant is a significant contribution to restoring the health of this ecosystem. Of course, the reasons why forest cover was lost in the first place must also be addressed for reforestation efforts to succeed,” said Reforesting for the climate of tomorrow co-author, Douglas Sheil.